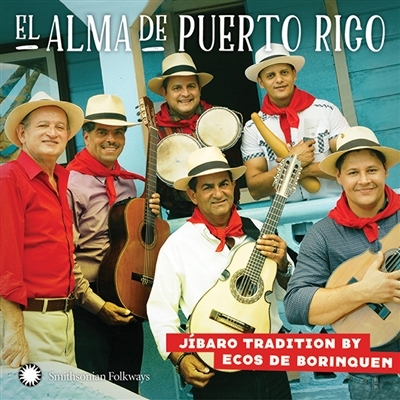 With El Alma de Puerto Rico (the soul of Puerto Rico), the Grammy- and Latin Grammy-nominated ensemble Ecos de Borinquen presents its second Smithsonian Folkways album overflowing with pride in the island’s jíbaro creole folk traditions. The soulful, signature sounds of Miguel Santiago Diaz’s sung poetry in the ten-line décima verse form are cradled in the progressive instrumental arrangements by Ramón Vásquez Lamboy for two cuatro guitars, six-stringed guitar, güiro rasp, and bongo. The crystal-clear voice of Yezenia Cruz, Santiago’s disciple, adds sonoral dimension to this timeless yet contemporary rendition of deep Puerto Rican tradition.